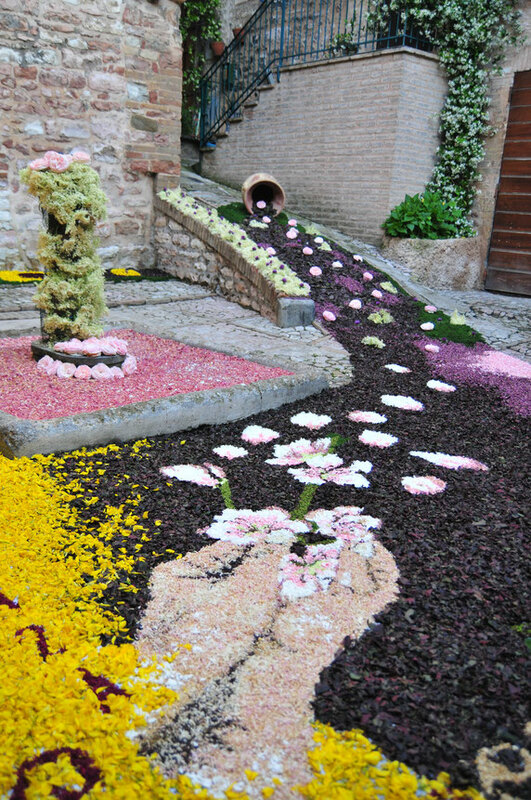 The tradition of Spello's infiorate has very ancient roots. 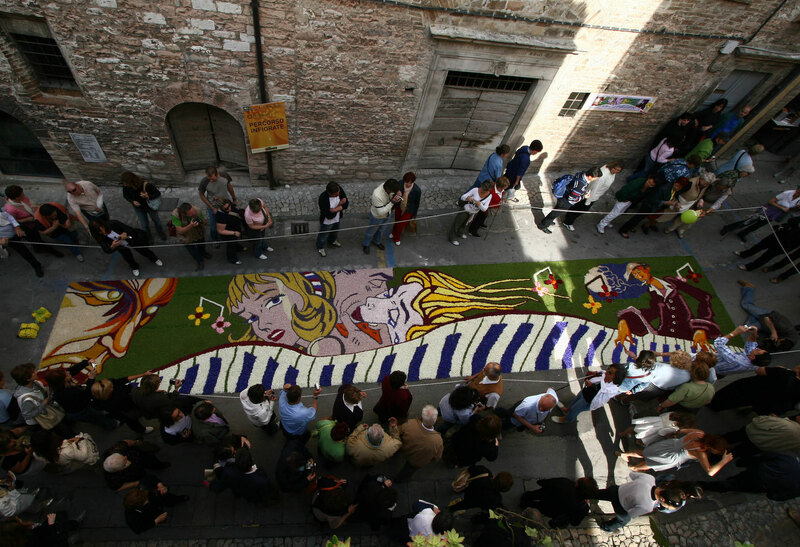 It seems that in the town's historical archives this "art" to launch and then put down plant matter through the streets during the Corpus Domini, even dates back to 1831! 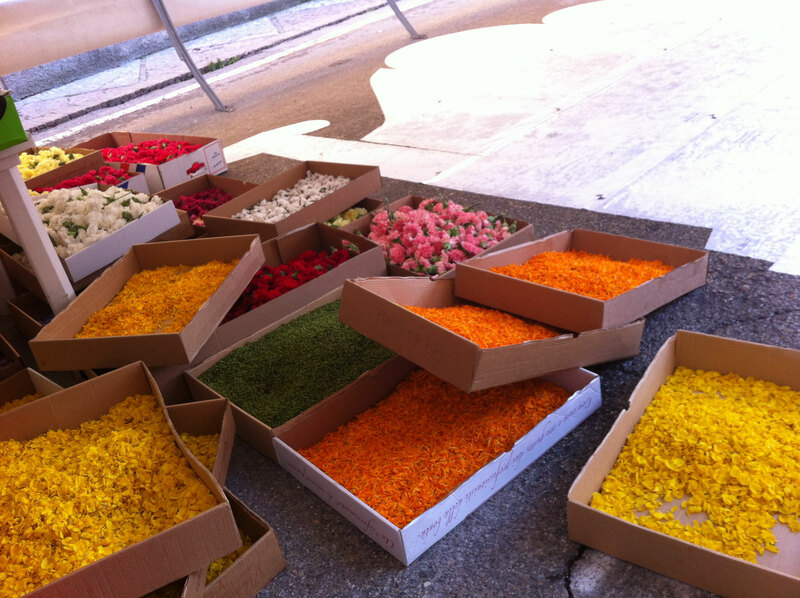 On 19 October of that year, during the visit of Bishop Ignatius Cedolini, the gonfalonier Giorgio Nicoletti was asked by all the inhabitants of the houses that were on the avenue where the procession would pass, to keep the area free from rubble and dirt And at the same time to spread flowers or vegetables. The first iconographic evidence dates back to the beginning of the 20th century, when the Mayor and painter of Spello, Benvenuto Crispoldi, represented in his paintings the infiorata during a passage of the Corpus Domini procession. 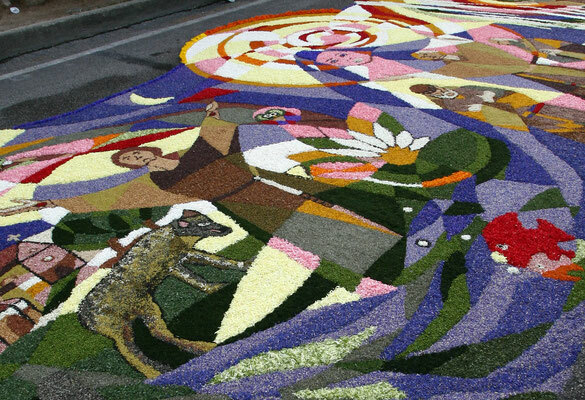 Soon the Infiorata tradition took hold and became a joyful and colorful tradition, beloved by all, involving prepare the flowers in a race looking for construction of more and more beautiful works, precise and surprising. 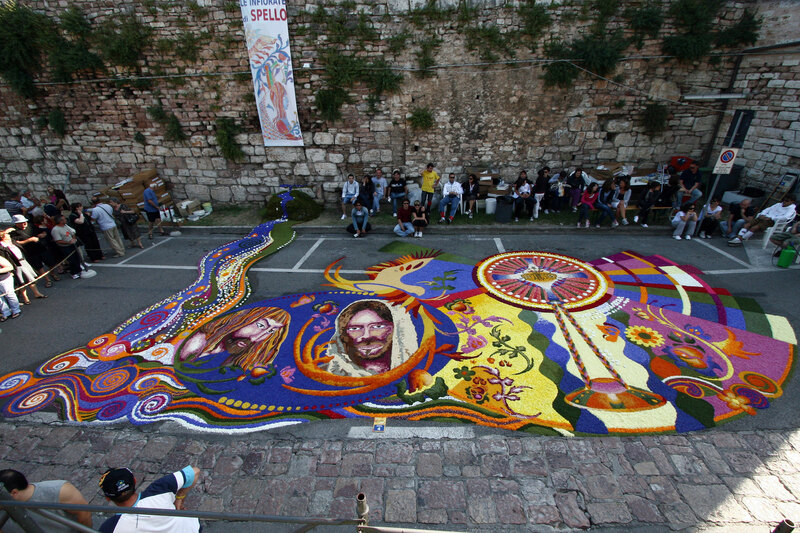 The Pro Spello has been organizing for forty years and since 2002 also by the "Le infiorate di Spello" Association, all supported by Local Authorities and Patronage of the Region. That is how, from 2007, from 60,000 to 100,000 people will arrive only in the weekend to attend this event. The preparation of the Infiorata is what most involve the teams participating in this colorful event. Everything, in fact, can start months or even years before the fateful passage of Corpus Domini. 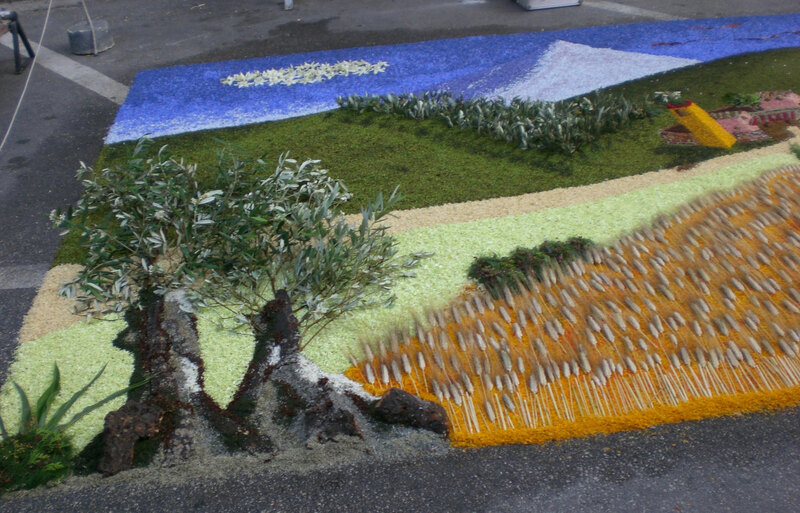 The first steps needed to prepare a flourish start from the search and harvest of flowers and see the participants disperse along the slopes of Subasio in search of perfect colors and flowers to create the desired representation while other members of the various teams devote themselves to the separation Of petals by color, chopping out the fresh herbs that came to the valley. On the eve of Corpus Domini, the lighting system is prepared and prepared with anti-rain and anti-wind systems to prevent adverse weather conditions from damaging the work of infiorators. 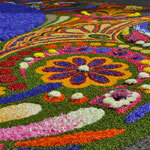 As a result, they prepare the designs on the road surface and, during the night it proceed to deposit the petals. That is, at 8 o'clock in the morning, the streets are ready and colored for the inflorata wait. In general, Spello's infiorata offers 60/70 different carpets of 12 to 15 m in length, with a minimum surface area of 15 mq and a maximum of 25 to 70 mq. 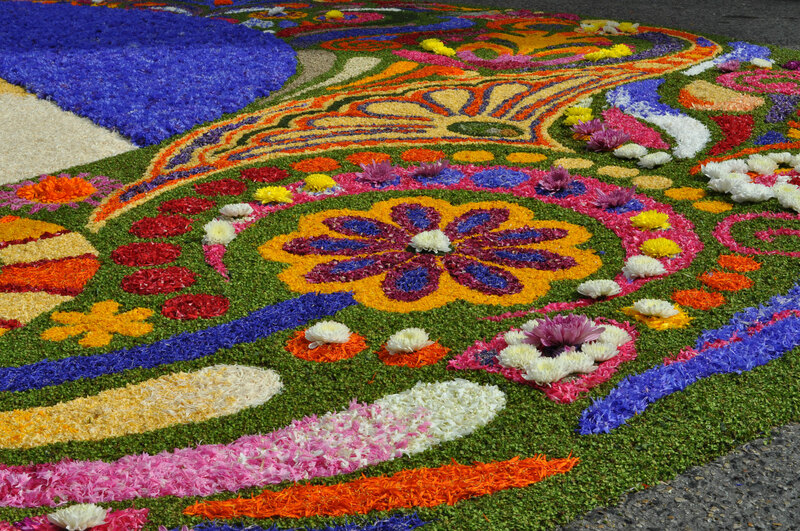 But it is the execution technique to make the inflorate particular because each carpet must be made using only untreated plant elements or conservative chemicals and even less colorants. 2. The inflorates can not be less than 12 meters in length and must be at least 1 meter away from the edges of the road to facilitate the passage to visitors. 3. One can trace the drawing on white paper only in the figurative parts, then provided that is not colored. 5. The infiorate must end by 8 o'clock on Sundays. 6. Only works with a religious theme are considered for the awards. 7. There are two juries, one composed of 5 members who are experts in art, architecture and theology disciplines that will evaluate the Quadri category, and one with 5 infiorator masters, randomly selected to evaluate the categories Carpets and Under 14. 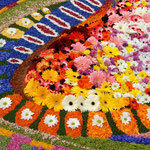 The species of flowers used in infiorata are numerous: cornflower, rose, carnation, poppy, fennel, vetch, iris, broom, elder, daisy, dandelion, thistle, serputello, planzago, viscaria, sage, linaria, marigold, anemone, cicirilli, magnolia , Chive, gaggia, fig, oak, walnut, cypress, pine, wild orchid. 1. 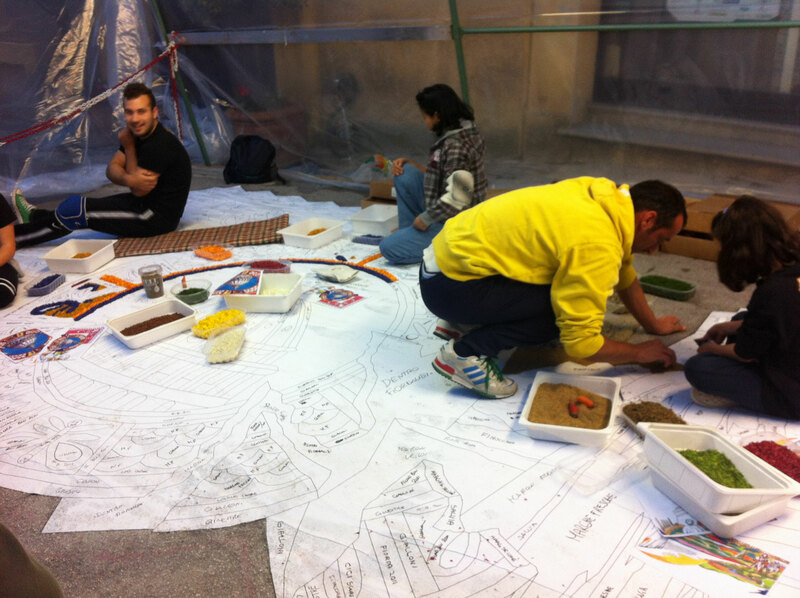 The first design phase takes into account the available road surface, in order to study the subject and the colors. 2. The second phase is to match the colors of the sketch and flowers available. 3. The third stage is the collection of flowers, which takes place at various times even a few hundred kilometers from Spello (mostly between Subasio and the Umbrian-Marche region). 4. 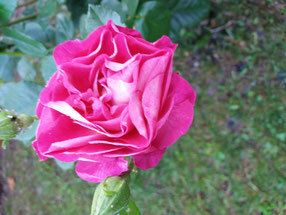 The fourth stage of flowering (or "capping") of flowers is the separation of petals by type and color. 5. 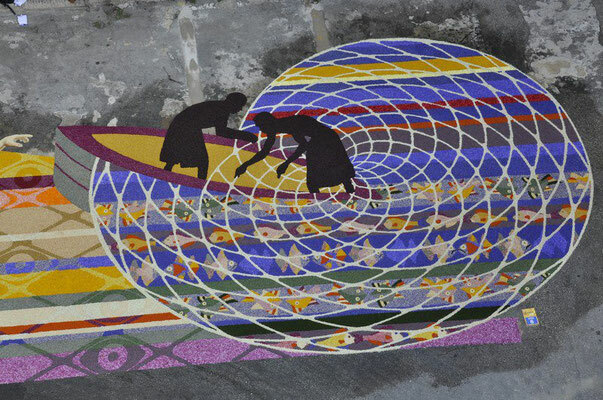 The fifth stage is the preparation of drawings on white paper, but not all the groups perform it, some draw the sketch directly on the road. 6. The sixth stage is the preparation of molds that facilitate the work of composition with the petals. 7.The seventh phase is the installation of tents or other covering systems that protect the works from rain by wind and other adverse meteorological conditions. 8. 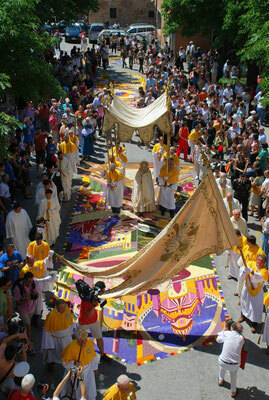 The eighth stage, performed in the afternoon of Saturday, is the sizing of the executed design (with glue). 9. 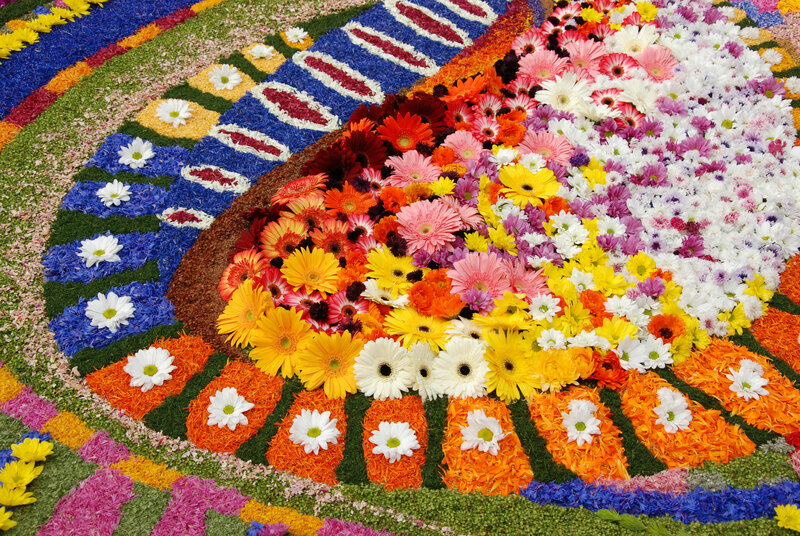 The ninth stage is the composition of the petal and vegetable design. Composition operations last from late afternoon on Saturdays all night until about 8 o'clock on Sunday morning before the Jury passes. From left to right, photos by: Tili Simone, Tili Pietro and Elvio Maccheroni. Lectio Magistralis: Students Secondary School of First Instance of l’Ist. Omnicomprensivo G. Ferraris di Spello showing tourists how to make an infiorata, in Italian, English and French. PROTESTS NIGHT OF FLOWERS ... MUSIC, EXHIBITIONS, MUSEUMS, SHOPS AND BARS OPEN ALL NIGHT! 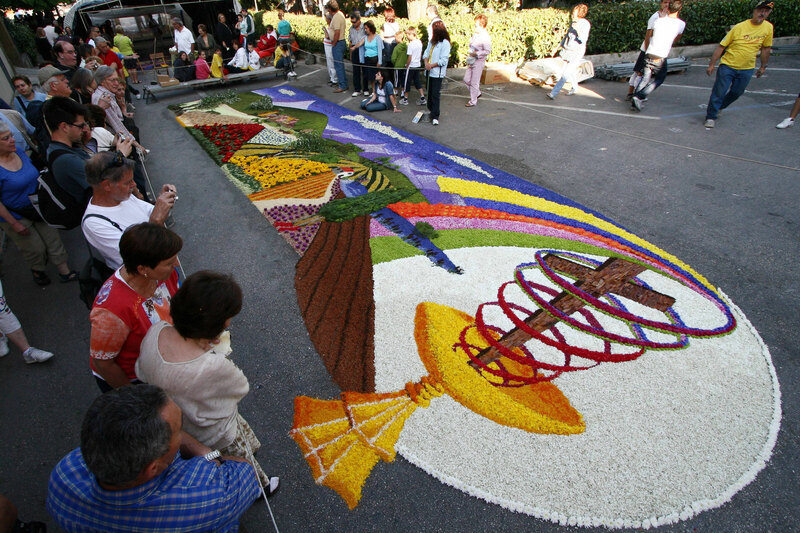 infioratori. 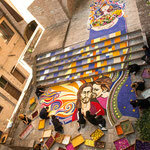 New this year, an area dedicated to an INFIORATA CHILDREN will be set up. Both sketches made by the painter Pietro Ricci. About 2,000 spellans are involved in the preparation and implementation of the Corpus Domini Infiorate, of which about 500 are children under the age of 14. 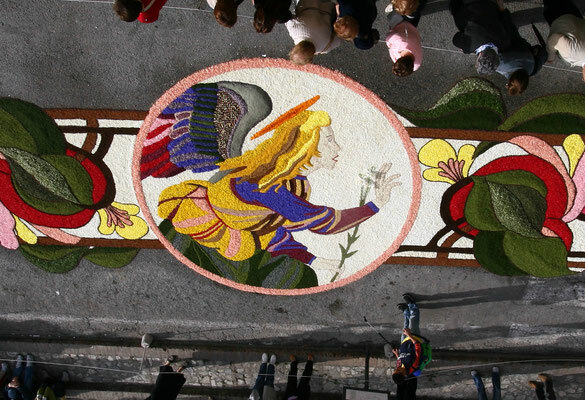 Every year Spello registers between 80 and 100,000 visitors on the Night of Flowers and during the procession of Corpus Domini. Over 250,000 visits to the Facebook fan Page and page in the week of the event: including American, Asian and other contacts from Italy and Europe. A hundred tourist buses, about 400 motorbikes and 300 motorhomes in parking lots and parking areas besides cars that are not counted. 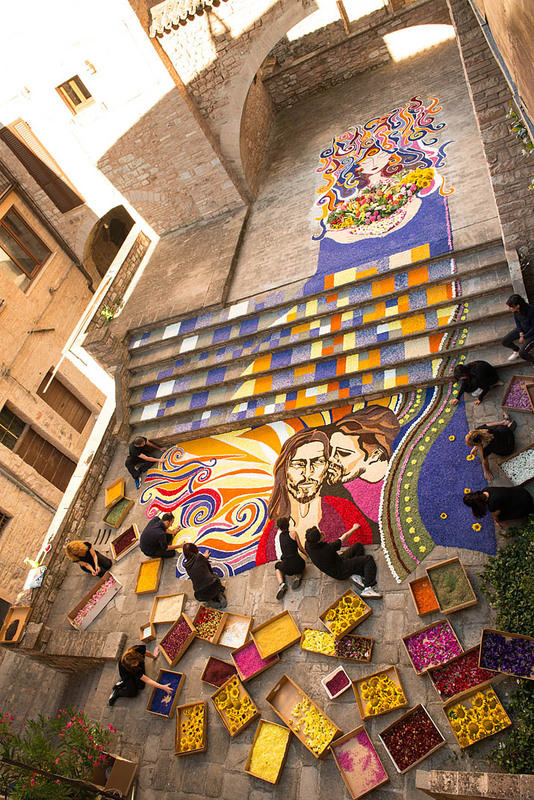 In Spello's Infiorata, the most extensive and well known, are made: Over 1,500 square meters of rugs and floral pictures, the route includes the main streets and alleys of Spello. 60-70 infiorate (And related sketches): 29 paintings (from 24 to 70 mq), 36 carpets (from 12 to 30 mq), 13 carpets Under 14. 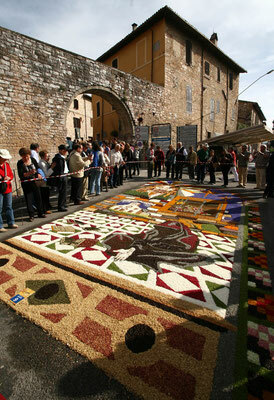 140 mq Is the measure of the largest Infiorata ever made by Spello Infiorators. 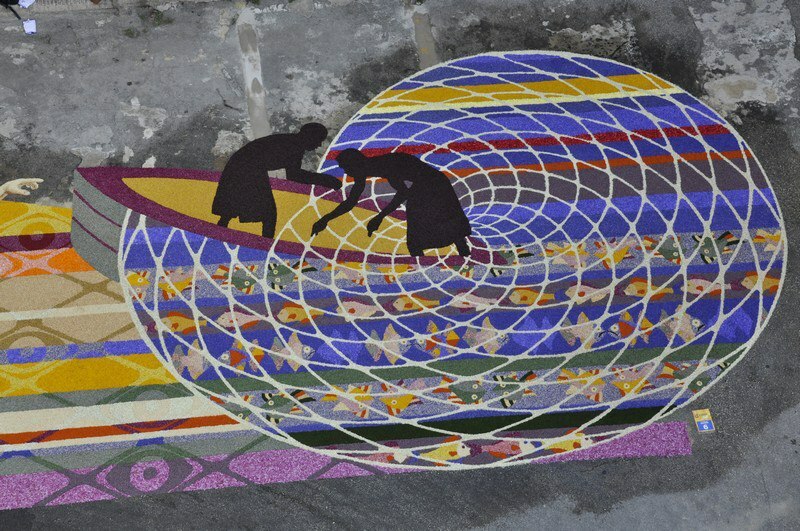 15 are the prizes for the category Quadri, 3 for the category Figurative Rugs, 3 for the category Geometric Rugs, 5 for the Under 14 category and 9 for the special prizes awarded with their own jury. The absolute winner is assigned the Trophy Properzio (bronze statuette), which will guard and deliver to the next winner of the contest of the following year! 2 Infopoint in the historic center of Spello at the disposal of tourists; About 50 shops in the old town open during the night of the flowers; About 85 volunteers served from Saturday to Sunday, providing information and regulating visitors' traffic, according to precise roadmaps. About 6 parkings made available to visitors and 2 parking areas reserved for the Camper. Only 1 person every year, trampling the Infiorate during the Corpus Christi Procession on Sunday morning: THE BISHOP, WITH THE SACRED SACRAMENT. Info Point Sistema Museo: via Tempio di Diana 9; tel. 0742-302239 spello@sistemamuseo.it; www.sistemamuseo.it; open from tesday to sunday ore 9-13 am (april-september). Booking routes and guided tours. Infiorart. Night city guided tours of the city's art cities and floral carpets starting from Santa M. Maggiore Church (for groups of up to 50 people visiting). From 10 pm on saturday to 1 am on sunday. From car parks to the main access points of the historic center. SPORTS CAMPING PARKING - Località Osteriaccia - Via Centrale Umbra - Exit from E45: Spello - Follow directions. At 400 mt from the historical center. Info and reservations: Polisportiva Julia +39 0742-652676 > A mainly paved and illuminated parking area for about 300 seats. Adjacent Camper Service: Consular Gate, at the entrance to the Old Town. Info: VV. UU. tel. +39 0742.651221 > Water, cockpit.